They may look pretty innocuous -- those leaf blowers, hedge trimmers and gas mowers wielded by a small army of gardening crews across the state. Yes, really, there will be more pollution from gas-powered gardening equipment than from cars. According to state air quality officials, those machines are some of the biggest polluters in California. In fact, by 2020, leaf blowers and other small gas engines will create more ozone pollution than all of the passenger cars in the state. Yes, really, there will be more pollution from gas-powered gardening equipment than from cars, confirms Michael Benjamin, division chief at the California Air Resources Board. “We expect that ozone-contributing pollutants from small off-road engines will exceed those same emissions from cars around the 2020 time frame,” says Benjamin. There’s a reason for that: Regulations on car exhaust have gotten tighter and tighter over the years, substantially reducing their ozone-damaging emissions. At the same time, while there have been some controls on the smaller gas engines, there haven't been enough, says Benjamin. Pollutants from all of those hedge trimmers and gas chainsaws across the state add up. “There are about 16 million pieces of small off-road equipment in California. That compares to a vehicle population of about 18 million statewide,” he says. So the state is planning some sweeping changes to fix that. The California Air Resources Board just proposed a new rule change—to lower emissions from small gas engines by 85 percent within a decade, starting in 2020. That will affect landscaping and gardening crews across the state. Noe Bautista of Los Angeles has been on the front line of that pollution most of his life. He has worked on a gardening crew for decades—inhaling the formaldehyde, benzene and particulate matter in the equipment fumes, and enduring up to 100 decibels of noise and constant machine vibration all day, six days per week. 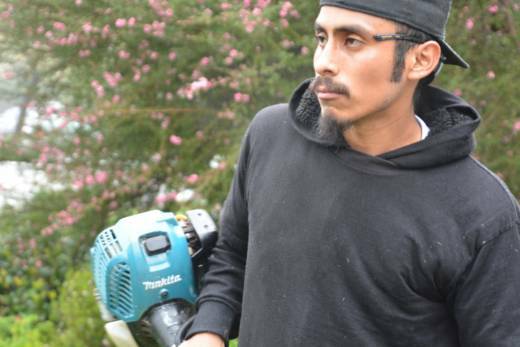 Now he runs Bautista’s Landscaping in western L.A., so he doesn’t run the gear himself anymore, but he sees his workers facing the same hazards every day. Bautista is determined that his workers won’t endure the same health problems he’s had. Cal/OSHA does have workplace safety guidelines in place and that helps, he says. But on many small gardening crews, most of the young workers either don’t know they should be wearing face masks or earplugs, or they refuse to wear them. 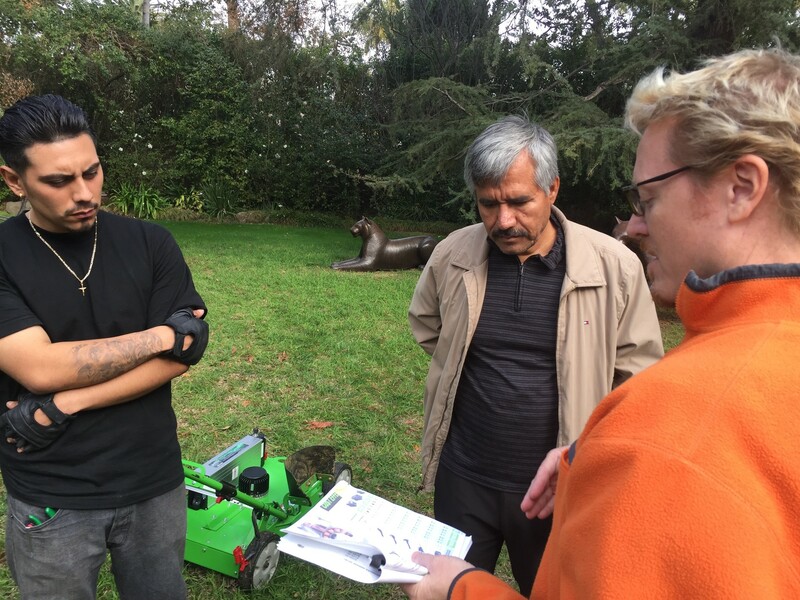 That’s why Bautista agreed to work with a nonprofit based in Santa Monica called American Green Zone Alliance (AGZA), which is trying to get these crews to switch to electric machinery. Dan Mabe heads the AGZA group. At an expansive backyard in western Los Angeles, he has spread out a wide lawnful of equipment for Bautista’s workers to test. Once they try out the green machinery -- which has less vibration, less noise and no fumes -- they’re hooked, says Mabe. And breakthroughs in technology have given the electric equipment additional power with longer battery life, so it makes sense financially to switch, too, he says. Mabe has worked these gardening crews himself -- “since I was 7 years old" -- and has the health scares and breathing problems to prove it. Mabe’s crusade to trade in gas for electric machinery is based on a desire to improve air quality and workers’ health. But there’s another motivation for him. Many gardening crews across California are Latino, he says, and that takes the discussion to another level. Of course, cost will be the sticking point. Many small crews could have trouble affording an upgrade to cleaner equipment. 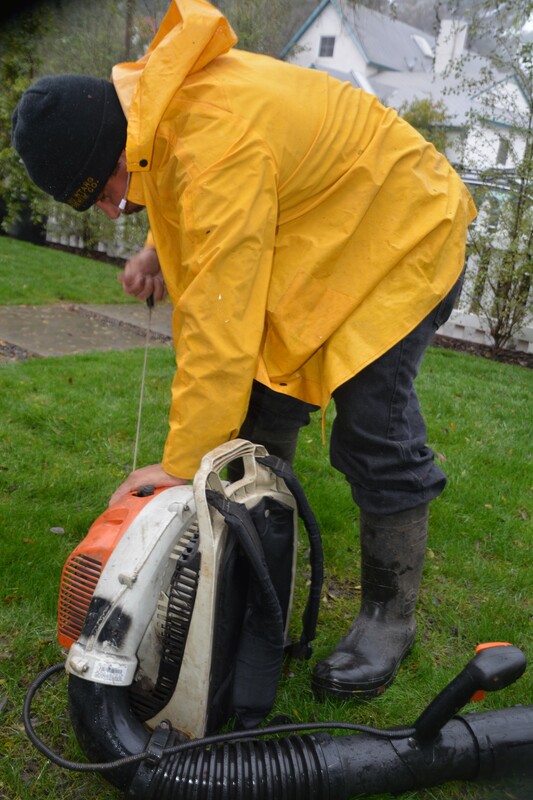 That's why the air quality board is putting $200,000 as seed money toward an incentive program to help landscape crews upgrade their gas equipment or convert to electric gear. But according to Sandra Giarde, executive director of the California Landscape Contractors Association, those incentive programs usually fall woefully short of actual replacement cost. And, she adds, the association is worried that manufacturers could pass on costs from new air quality requirements, in the form of higher prices. Bautista, for one, is ponying up the cash now and making the switch. Not only for health reasons, and not only to get ahead of impending new regulations. He says the economics are actually in his favor. With huge recent improvements in battery life and power, he hopes in the long run he’s going to save a little money.